The much anticipated Rotor S1 Stem is now available to order from us in the UK, either trade or retail from the VeloTechServices.co.uk website. The S1 Stem passed the most demanding European standard fatigue test (EFBe-Standard 7520), carried out by the German EFBe Institute, with very positive results. The S1 stem design easily passed the most stringent tests offered by this institute for both Road and MTB stems. 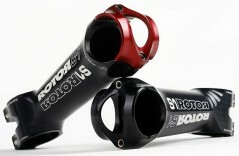 This result ensures logistical simplicity in that we can offer a single stem design to both Road and MTB consumers. Obviously, laboratory tests do not always represent real life scenarios, so a number of top level athletes – pro and amateur, technically adept and dummies, alike – have been testing the S1 stem for over 4 months. The feedback received from these athletes, amongst which more than one UCI champion, was instrumental in achieving the S1 project’s primary goal: To set a new standard. RCT is proud to present to you the S1 stem: not just one of the stiffest and strongest stems in the market, but of the very lightest as well! The S1’s DTT (Double Thread Technology), as applied to our Ágilis crank already, was the other hot issue of this test. The outcome has certified it as a bombproof clamping system for any application. This innovative bolt system already provides secure clamping of the handlebar with just 3,5Nm of fastening torque. It’s easily capable of enduring the punishment that top level cycling can dish out.